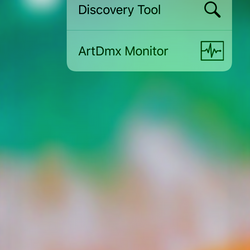 The ArtnetControl app is one of the most comprehensive Art-Net capable app's available for iOS. Now lighting technicians en riggers can quickly check and position conventional fixtures, and monitor and troubleshoot Art-Net networks. All from your iPhone or iPad! You don't have to drag your lighting desk to the stage anymore during setup, just to put a six-bar in position. Just take controle right from the Layer-construction or platform. Or what about the guessing-game or the tedious troubleshooting when node's and fixtures aren't doing what you would like them to do? Now you can see exactly what is happening on your network. Find patch faults or merging errors with ease. 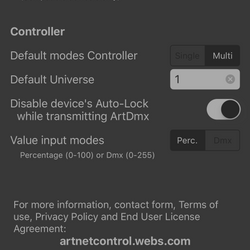 The Controller tool allows you to transmit ArtDmx. It is intended to be used as a riggers remote, to check or position your conventional fixtures. The whole workflow is specially designed for quick access and handling. You can enter universes, channels and value's in any order and combination. 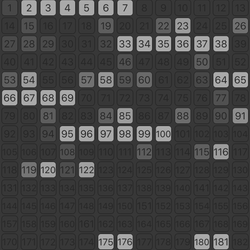 Simultaneous transmission up to 20 universes is supported, not necessarily sequential. A modus selection between 'single' and 'multi' is provided to choose whether you would like only the last entered command to be activated, or all commands to be handled as mutations upon each other. Value's can be entered as percentages (0-100) or as dmx values (0-255). 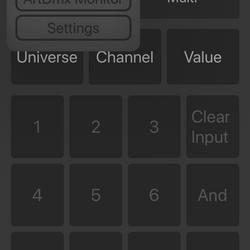 Or if no value is entered, it turns the selected channels to 100%. At this moment there isn't any functionality present, specifically designed for intelligent fixtures. 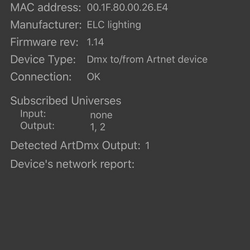 This tool does exactly what the name suggests; it discovers Art-Net compatible devices in your network. It will show you the name of discovered devices, what type of devices it is and it's IP address. 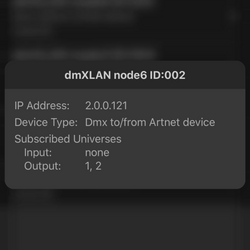 So from now on you don't have to wonder about IP addresses anymore, or if a specific device is connected. Now you can see exactly what is going on on your network. This tool shows which universes are being transmitted by what controller. 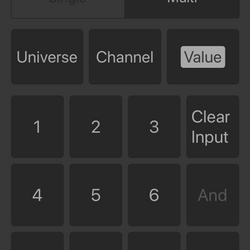 And if you select a universe, even channel information is shown. 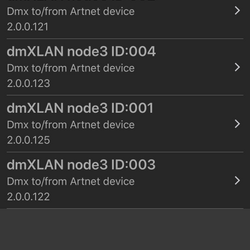 No more guessing which controller is causing problems with the Dmx merge. But also very handy to check your universe and channel patch.